Authorities said the death toll may rise from yesterday’s crash. 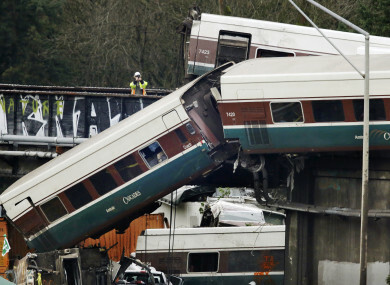 AN AMTRAK PASSENGER train traveling on a new route for the first time derailed yesterday in Washington state, killing at least three people as cars plunged off a bridge onto a busy highway at the height of morning rush hour, officials said. The train, which was carrying 77 passengers and seven crew, derailed in DuPont about halfway between Tacoma and the state capital Olympia on a curve that passes over busy Interstate 5 at about 7.40 am (3.40pm Irish time). The local transport authority has said that the train was travelling at 80mph in a 30mph zone. None of the people in vehicles traveling on the highway below the train were killed, according to Ed Troyer, a spokesman for the Pierce County Sheriff’s Department. The next thing we know, we’re being slammed into the front of our seats, windows are breaking, we stop, and there’s water gushing out of the train. People were screaming. The accident marred the launch of faster services on the route after a $181 million upgrade project that included improving the rails, the signaling technology and the locomotives. Local officials had worried about trains going at higher speeds through the curves in the area. The trains were expected to reach speeds of 127 kilometers per hour through the densely populated area with the improved systems and track. Email “Derailed train was going 80mph in a 30mph zone”. Feedback on “Derailed train was going 80mph in a 30mph zone”.